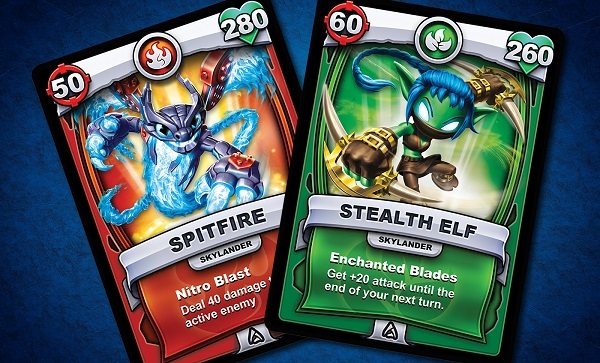 In case you thought Skylanders couldn’t become any more popular than it already is, the folks at Activision Blizzard are getting ready to prove you wrong with the introduction of a brand new collectible card game based on the uuber-popular property: Skylanders Battlecast. Skylanders as risen to fame over these past few years because of a very simple formula: Mix quality collectible figurines with solid adventure gameplay in a way that lets you literally teleport your favorite toys into the game. In case you’re not familiar with the series, it began as a spinoff of the popular Spyro games and has since taken on a life of its own. Players collect figurines and playsets at their local store and, using a portal that’s tethered to your gaming device, you can swap out your playable character and various items by physically moving the toys around. The success of the Skylanders series has now spawned a couple of clones, including Disney Infinity and Legos Dimensions. It should come as no surprise, then, that Activision Blizzard plans to capitalize on that popularity by introducing Skylanders Battlecast for mobile devices. In short, it’s basically Hearthstone for kids. Similar to Skylanders on consoles, Battlecast will blend the physical and the virtual worlds. You can buy card packs online and play like you would in any other digital card battle game, or you can pick up physical packs of cards and scan them into the game. We take that to mean that you’ll be able to play a physical version of Battlecast, though those physical cards could just be collectible items with the sole purpose of looking cool and unlocking stuff in the digital game. We’re not entirely sure on that one just yet. Considering the fact that card games like Magic, Pokemon and Yu-Gi-Oh have managed to thrive on the virtual market, I have a sneaking suspicion that Activision Blizzard will once again be capturing lightning in a bottle with this latest addition to the virtual CCG scene. Look for Skylanders Battlecast to arrive on iOS and Android sometime in 2016.